Cleopatra Films has acquired all domestic rights to Luke Treadaway�s �A Street Cat Named Bob,� Variety has learned exclusively. The film is an adaptation of James Bowen�s best-selling book of the same name, which chronicles his life as a street musician and recovering addict barely getting by in London. 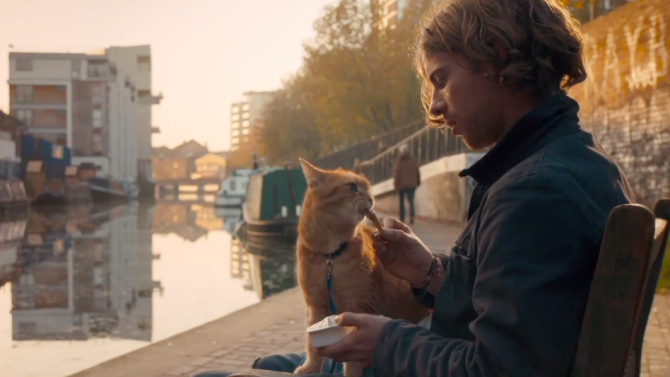 He adopts a stray ginger cat, names him Bob, nurses him back to health, and takes him to guitar-playing gigs � and the pair became an instant attraction. Cleopatra Films, the movie division of record label Cleopatra Records, plans a Nov. 18 release in at least 20 U.S. markets. Roger Spottiswoode directed from a script by Tim John and Maria Nation, and produced by Adam Rolston for Shooting Script Films. Joanne Froggatt (�Downton Abbey�) and Ruta Gedmintas also star. �A Street Cat Named Bob� was first published in the U.K. in March 2012 and spent a record 70 consecutive weeks on the Sunday Times bestseller list. The book has now been published in more than 30 territories, including the U.S., China, and Japan, and sold more than five million copies worldwide. Damian Jones serves as executive producer on the film. Prescience fully financed the production, and Tim Smith, Paul Brett, Anders Erden, and James Swarbrick serve as executive producers. The Exchange handled sales. Sony Pictures Releasing International and Stage 6 Films will launch the film on Nov. 4 in the U.K. and in multiple territories this fall.